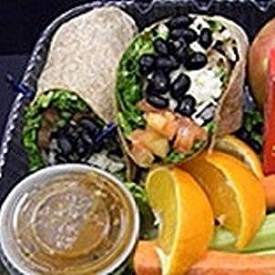 The fiesta burrito recipe is a colorful vegetarian option developed by the California Culinary Centers for school food service menu planning. This recipe yields 48–4.75 ounce fiesta burritos. Remove tortillas from freezer to thaw. Hold in warmer. Preheat conventional oven to 375°F or convection oven to 350°F. Rinse and drain black beans in colander. Place beans in one–12 inch by 12 inch by 4 inch steam table pan. Heat beans in oven for approximately 12 to 15 minutes. Critical Control Point (CCP): Heat beans to at least 135°F for 15 seconds. Hold in warmer at 135°F or higher for assembly. Rinse, trim and drain lettuce in colander. Slice lettuce into about 1 inch strips. Place lettuce in one–12 inch by 12 inch by 4 inch pan. Hold in refrigerator for assembly. CCP: Hold at 41°F or lower for service. Rinse and trim stem end from tomatoes. Chop tomatoes into ¼ inch pieces. Place in one–12 inch by 20 inch by 4 inch steam table pan. Hold in refrigerator for assembly. CCP: Hold at 41°F or lower for service. Place shredded cheese in one–12 inch by 20 inch by 4 inch steam table pan. Hold in refrigerator for assembly. CCP: Hold at 41°F or lower for service. Remove warm tortillas and beans from warmer. Place pans of ingredients in order of assembly: tortillas, beans, lettuce, tomatoes, and cheese. Place tortillas on one–20¾ inch by 12¾ inch by 1 inch sheet pan. Scoop ¼ cup or one number 16 scoop beans onto tortilla. Spread ¾ of the length of the tortilla. Top beans evenly with ½ cup or one number 8 scoop shredded cheese. Top cheese with ½ cup or one number 8 scoop lettuce. Top lettuce with ¼ cup or one number 16 scoop chopped tomatoes. Portion 1–4.75 ounce burrito each immediately for serving. This recipe yields 96–4.75 ounce fiesta burritos. Rinse and drain black beans in colander. Place beans in two–12 inch by 12 inch by 4 inch steam table pans. Heat beans in oven for approximately 12 to 15 minutes. Critical Control Point (CCP): Heat beans to at least 135°F for 15 seconds. Hold in warmer at 135°F or higher for assembly. Rinse, trim and drain lettuce in colander. Slice lettuce into about 1 inch strips. Place lettuce in two–12 inch by 12 inch by 4 inch pans. Hold in refrigerator for assembly. CCP: Hold lettuce at 41°F or lower for service. Rinse and trim stem end from tomatoes. Chop tomatoes into ¼ inch pieces. Place in two–12 inch by 20 inch by 4 inch steam table pans. Hold in refrigerator for assembly. CCP: Hold tomatoes at 41°F or lower for service. Place shredded cheese in two–12 inch by 20 inch by 4 inch steam table pans. Hold in refrigerator for assembly. CCP: Hold cheese at 41°F or lower for service. Place tortillas on two–20¾ inch by 12¾ inch by 1 inch sheet pans. Scoop ¼ cup or one number 16 scoop beans onto tortilla. Spread ¾ of the length of the tortilla. Top beans evenly with ½ cup (one number 8 scoop) shredded cheese. CCP: Heat beans to at least 135°F for 15 seconds. Hold in warmer at 135°F or higher for assembly. CCP: Hold lettuce at 41°F or lower for service. CCP: Hold tomatoes at 41°F or lower for service. CCP: Hold cheese at 41°F or lower for service.